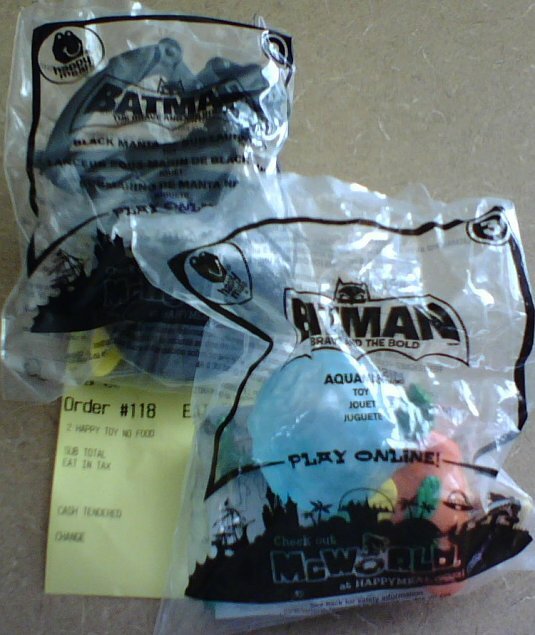 I've been telling you to keep an eye on HappyMeal.com for the Batman: Brave and the Bold toys. Well, I finally got 'em for myself. 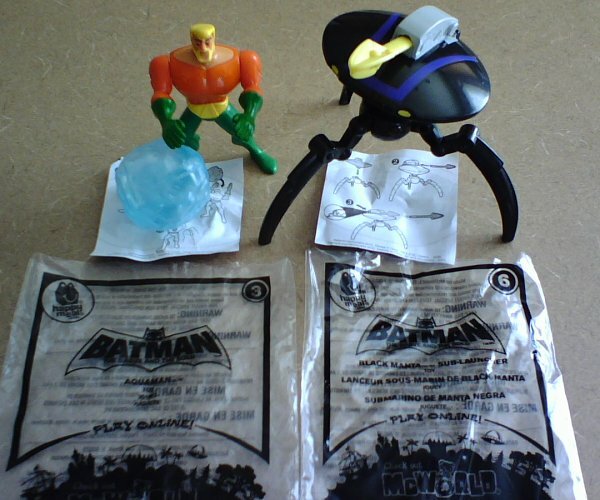 Hubby and I went down to our local McDonald's and asked if I could just get the Manta Ship and Aquaman toy. The manager nicely found one of each for me, and we were done. Couldn't have been any easier. As I really can't eat any McDonald's foodstuff anymore, I just got the toys. Hence the receipt saying "2 HAPPY TOY NO FOOD". I would have liked to get a second set of the two toys to keep in package, but we can't really swing it right now. So after photographing the two for this post, I unwrapped them and played around a little. Then posed them for another photo. As you can see, the toys are number 3 (Aquaman) and number 6 (Black Manta Sub Launcher). The Mantaship is not to scale with Aquaman, but is still really cool. I wouldn't be at all surprised if it is recalled due to the danger of the launching spear. It flies a nice distance! The Aquaman figure has a switch in back: you hold the switch down, put the water ball on his hands, then let go and he throws it. Not nearly as satisfying as the sub launcher, but if you say, "OUTRAGEOUS!" as you have him throw, it helps a little. I kind of wish I got a full Happy Meal so I could get the box as well... but that's for another attempt I guess.